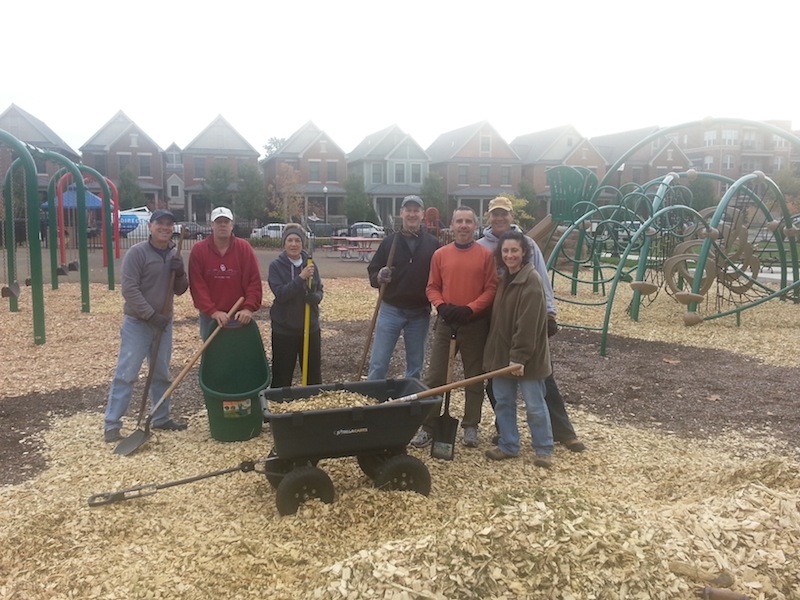 On a cold but sunny Saturday morning, volunteers with the Harrison West Society Parks and Green Space committee spread around 300 square yards of mulch on the playground in Harrison Park. (I know; the photo doesn’t look sunny, but it was sunny when we started. The photo was taken when we were about done.) We all started out in coats, but within 30 minutes, most of our coats were piled on the playground equipment. Who knew that hauling and spreading mulch was such a good workout! With Timbits in hand, seven volunteers spent three hours in the park rebuilding the injury-preventing layer of material in the older-kids section of the playground. The mulch, which is supplied by the Columbus Recreation and Parks Department, decomposes over time, so periodically, new mulch needs to be added to maintain the cushy surface. We’ll be remulching the play area in Harrison West Park in the spring. If your kids love to play in our fantastic playgrounds, contact Bob Mangia to get on our e-mail list and plan to help us out in a few months. It makes the playgrounds safer for your kids, and it’s good exercise. And it’s a great way to socialize with your neighbors. If you just can’t wait to lend a hand at a Parks and Green Space event, though, you’ve got one more chance this season. On November 9, 2013 beginning at 9 a.m., we’ll be removing approximately 35 young redbuds that have sprouted in Side by Side Park and replanting them along the river bank. We can certainly use a lot of shovels and hands for this end-of-season wrap up event. Contact Matthew Williams if you would like to help out. Next year, we will again offer our Adopt-A-Bed program. 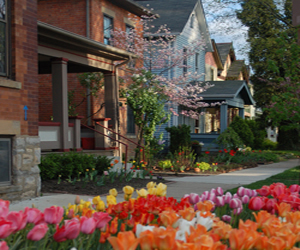 Many beds in the neighborhood are orphaned and need an adopter to visit them once a month for weeding and general maintenance. You can adopt a bed by contacting Matthew or Bob. Finally, we’ll be looking for volunteers in the spring to help out with a tree survey. Each volunteer will take a walk along both sides of two or three streets and note addresses where tree-lawn trees need to be limbed up. Once we have the full list, we’ll contact the city to get them all done at the same time. Contact Bob or Matthew for more information.